Those words came to mind after visiting The Village at Grand Traverse Commons, a mixed-use commercial development on the grounds of a former state psychiatric hospital in Traverse City, Michigan. Surely, the entrepreneurs who have repurposed a swath on the massive property view the development of apartments, condominiums, shops, restaurants and offices differently. For them, the development breathes new life into decaying buildings that have remained empty since 1989, when laws and treatment theories moved away from housing people with mental illnesses in large, isolated, and congregated facilitates. I understand the civic impulse to preserve the sprawling complex. The main building’s Victorian-Italianate design is architecturally significant and is listed on the National Register of Historic Places. 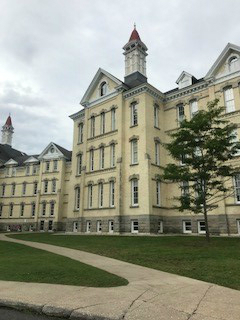 Like similar institutions around the country built in the late 19th Century, the Northern Michigan Asylum was built around the theory that “beauty is therapy.” Essentially, the idea was that pleasant surroundings, such as having tastefully landscaped grounds and fresh flowers produced from the on-campus greenhouse year-round, would be therapeutic. However, as an advocate for people with disabilities, I find the notion of commercializing a site where people struggled with mental and other illnesses unsettling. For example, I winced at the spooky imagery on a web site promoting a twilight tour of the complex as an “otherworldly experience” where one can “…listen for the creaks and groans of the asylum ‘cottages’ settle at night.” Such language perpetuates many negative stereotypes about people with mental illness! Certainly, the grounds of the Grand Traverse Commons are lovely. In fact, the area near the one-time asylum’s farm has been developed into The Botanic Garden at Historic Barns Park, incorporating existing meadows, hillsides and a pair of large Victorian barns. In a nod towards its history, the garden is being organized as a series of 19 interlocking “healing gardens” forming a ribbon through the length of the property. Plans call for featuring a traditional Native American “medicine wheel” garden, a medicinal herb garden and labyrinth, a wheelchair-accessible garden, a meditation garden, a water garden, and educational and recreational areas. The tranquil imagery promoted in this part of the development seems more fitting for the site’s history. Nonetheless, I can’t help but think that for anyone who was ever “sent away” to the asylum – or whose loved one lived there – this remains hallowed ground. No amount of architectural rehabilitation or public relations spin can alter that. In short, the Grand Traverse Commons isn’t my idea of a place to live, work, or seek entertainment. The short driving tour of the complex that I took during a recent vacation will remain my only visit. Molly Klocksin has been a Case Advocate at Disability Rights Nebraska for 16 years. She holds a B.A. in Journalism from the University of Wisconsin-Eau Claire and an M.A. in Counseling from Doane University, Lincoln, Nebraska.